Every once in a while magazines and websites will do reviews of our gear, and I figure it’s time to start sharing them on our blog. We would love to know what you think so let us know if you enjoy having access to reviews here on the blog or not and if they are helpful or not. Here are a couple of reviews our gear has recently received. I am lucky to live in a place where monsoons are non-existent, but we do have a good down pour on occasion. 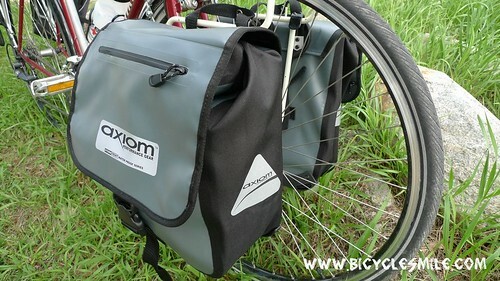 I had been looking for a smaller front pannier bag for my city/touring bike and the Axiom Monsoon seemed to fit the bill, so I thought I would try them out and put them through their paces. Cole got this rear rack from Axiom and we threw it on his dad’s Trek 7.3 before our 3 day tour, and it handled the job fine. Weighing in at a mere 700 grams, this rear rack is super light, but super tough with it’s triple stay design and sweep-back support for panniers. The stay length is adjustable, fitting 26″, 27″, and 700cc sizes. My dbl. sided panniers didn’t show up in time, so i had to rock a single- no problems rack wise, although it did take a little getting used to of riding with an extra 50 or so pounds on one side. Topped off with a tent & sleeping bag, this rack held up great- no complaints. And when I left it, it still looked brand new.